Cheat Claim Santa Claus's Reward Event Xmas Ninja Saga. Ninja Saga Has a bug in the Game, You can Claim Rewards Easily using Charles, I already try it and Working 100% [Permanent]. 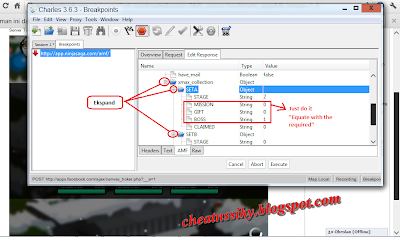 let's ty..
Now click "Edit Response" >> "AMF"
NB: If This Cheat get eror you Must Complete in the usual a way. And do this Cheat in Next Stage !Don't Forget press "ctrl+D" Bookmark this Blog !